We help just about everyone celebrate just about anything. You know what you want, and we know how to make sure you get it. You bring the guests… let Stellar Lanes take care of the rest! Celebrate your next function with a bowling party! 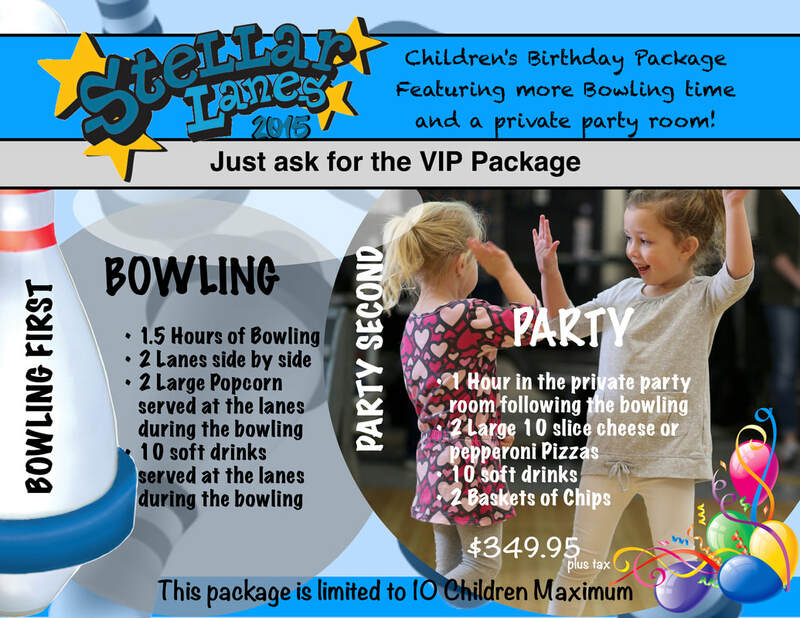 As a top destination for parties of all kinds, Stellar Lanes is party central. Bowling centres have long been a favourite for children’s birthdays. Whenever you are planning any of the following, give Stellar Lanes a call and learn about the packages we have to offer. Our newest option for Childrens birthday parties! $100.00 Deposit required upon booking, Minimum 10 children per booking. ​Maximum 6 Children per lane. ​Multiple lane bookings are welcome. ​10 Children maximum per party. If you require a booking outside of our operating hours please call. We would be happy to do our best to accommodate you and your party! ​Deposits are non-refundable, If the party is cancelled 7 days prior to the original booking date the deposit can be applied to your next party. ​Maximum 6 people Per Lane. No outside food or drinks will be allowed inside the bowling centre (Birthday cakes is the only exception with the purchase of a birthday or event package). Reservation bookings are time based. Please arrive at least 15 minutes prior to you reservation time to check in and receive shoes. If your party does not arrive by the reservation time, the reservation may be cancelled. Due to time based reservations, arriving late may reduce your bowling time as reservations are booked back to back.